People, Power, and Profits: Progressive Capitalism for an Age of Discontent, W.W. Norton, April, 2019. Also published in the UK by Allen Lane/Penguin. Globalization and Its Discontents Revisited: Anti-Globalization in the Era of Trump, W.W. Norton, November 2017. Also published in the UK by Allen Lane/Penguin. The Euro: How a Common Currency Threatens the Future of Europe, W.W. Norton, August 2016. Published in paperback in 2017. Also published in the UK by Allen Lane/Penguin, in Bulgarian by Iztok-Zapad, in Catalan by Edicions 62, in Chinese complex characters by Business Weekly, in Chinese simplified characters by China Machine Press, in Croatian by Profil, in Czech by Euromedia Group, in Dutch by Athenaeum, in French by Les Liens qui Liberent, in German by Siedler, in Greek by Editions K. Papadapoulos, in Italian by Guilio Einaudi Editore, in Japanese by Tokuma Shoten, in Korean by The Open Books Co., in Polish by Wydawnictwo Krytyki Politycznej, in Portuguese by Bertrand Editoria, in Romanian by Editura Publica, in Serbian by Akademska Knjiga, in Spanish by Taurus, and in Swedish by Atlantis. Audiobook by Audible. Rewriting the Rules of the American Economy: An Agenda for Growth and Shared Prosperity, W.W. Norton, November 2015. Also published in audio format by Random House Audio. Translated and published in Chinese complex characters by Commerical Press, in Chinese simplified characters by China Machine Press, in Italian by il Saggiatore, in Japanese by Tokuma Shoten, in Korean by The Open Books Co., and in Portuguese by Bertrand. Available at http://www.rewritetherules.org. The Great Divide: Unequal Societies and What We Can Do About Them, W.W. Norton, April 2015. Published in paperback in 2016. Published in audiobook in 2016. Also published in the U.K. by Penguin Books and in audio format by Audible. Translated and published in Chinese complex characters by Commonwealth Magazine Group, in Chinese simplified characters by China Machine Press, in French by Les Liens qui Liberent, in German by Siedler, in Italian by Einaudi, in Japanese by Tokuma Shoten, in Korean by The Open Books Co., in Portuguese by Alta Books (Brazil) and Bertrand Editoria (Portugal), in Romanian by Editura Publica, in Russian by Exem License Limited, in Serbian by Akademska Knjiga, and in Spanish by Taurus. Creating a Learning Society: A New Approach to Growth, Development, and Social Progress, Columbia University Press, May 2014. Reader's Edition published June 2014 and paperback, October 2015. Now available as an audiobook on Audible.com. Also published in Chinese (simplified)/China (mainland PR) by CITIC Publishing Group (Published June 2017), Czech/World by Nakladatestvi Academia (Expected September 2017), French/World by Editions Les Liens Qui Liberent (Expected Spring 2017), German/World by Ullstein Buchverlage GmbH. (Published 10/9/15), Hungarian/World by Napvilag Kidao Kft. (Published 2016), Italian/World by Giulio Einaudi Editore (Expected end of 2017), Japanese/World by Toyo Keizai Inc. (Published October 2017), Korean/World by The Korea Economic Daily & Business Publications (Published 2016), Portuguese/World ex. Brazil by Bertrand Editora Ltda, Spanish/Latin America and US by Ediciones Culturales Paidos (Published 10/15/15) and Spanish/World ex. Latin America and US by La Esfera De Los Libros, S.L. (Published 1/26/16), Vietnamese by National Publishing House of Vietnam (Published 2017). Economics of the Public Sector, Fourth Edition, with Jay K. Rosengard, W.W. Norton & Company, February 2015. Also published in Chinese simplified by China Renmin, in French by De Boeck, in Italian by Hoepli, and in Spanish by Antoni Bosch. Third Edition, W.W. Norton & Company, 2000. Also published in Chinese (simplified) by China People’s University Press and China Renmin, in French by Edition de Boeck, in Italian by Ulrico Hoepli Editore, in Japanese by Toyokiezai Shinposha Ltd, in Macedonian by Macedonian Ministry of Finance and Tabernakul Publishing, in Polish by Wydawnictwo Naukowe PWN, in Portuguese by Editora Atlas (Brazil), in Serbian by the University of Belgrage Economic Department and Center for Publishing Activiti, in Spanish by Antoni Bosch. Second Edition, W.W. Norton & Company, 1988. Also published in Czech by Liberal Institute/USIA/ Victoria Publishing, in Chinese (simplified) by China People’s University Press, in Estonian by the Estonian Institute of Public Administration, in Greek by Kritiki, in Hungarian by Kozgazdasagi Ed Jugi Konyvkiado, in Japanese by Toyo Keizai Shinposha, in Spanish by Antoni Bosch, and in Ukranian by Osnovy Publishers. First Edition, W.W. Norton & Company, 1986. Also published in Czech by Liberal Institute USIA/ Victoria Publishing, in French by Editions de Boeck, in German by Oldenbourg Verlag, in Italian by Ulrico Hoepli Editore, in Japanese by McGraw Hill Book Co. and Toyokeizai Shinposha, in Norwegian by Norsk-Lyd, in Portuguese by Editora Atlas, in Russian by Moscow University Press, in Spanish by Antoni Bosch, and in Turkish by Marmara University USIA. Selected Works of Joseph E. Stiglitz: Volume II: Information and Economic Analysis: Applications to Capital, Oxford University Press, May 2015. The Price of Inequality: How Today's Divided Society Endangers Our Future, WW Norton, April 2013. Also published in the U.K. by Penguin/Allen Lane and in audio format by Tantor Media. Translated in Arabic by National Center for Translation, Egypt, in Bulgarian by Iztok-Zapad, in simplified Chinese by China Machine Press, in complex Chinese by Commonwealth, in French by Les Liens Qui Libèrent, in German by Siedler, in Greek by Papadopoulos, in Hebrew by Calcalist, in Italian by Einaudi, in Japanese by Tokuma Shoten, in Korean by Open Books, in Polish by Krytyka Polityczna, in Portuguese by Bertrand Editora, in Romanian by Editura Publica, in Russian by Exem License Limited, in Spanish by Taurus and Penguin Random House Grupo Editorial, in Tamil by Aazhi Publishers, in Thai by SE-Education Public Company Limited, in Turkish by Iletisim Yayincilik, in Ukranian by Ecem Media, and in Vietnamese by Knowledge Publishing House. Freefall: America, Free Markets, and the Sinking of the World Economy, WW Norton, January 2010. Also published in the UK by Penguin/Allen Lane. Translated in Arabic by Dar Al Kitab al Arabi, Bahasa Melayu by Institut Terjemahan Negara, Bulgarian by Info Dar, complex Chinese by Commonwealth, simplified Chinese by China Machine Press, Dutch by Het Spectrum, Estonian by Tänapäev, French by Les Liens qui Liberent, German by Siedler, Greek by Papadopoulos, Italian by Einaudi, Japanese by Tokuma Shoten, Korean by Book 21, Polish by Polish Economic Society, Portuguese (Brazil) by Companhia das Letras, Portuguese (Portugal) by Ana Paula Faria, Romanian by Editura Publica Com Srl, Russian by Eksmo Press, Serbian by Media II, Spanish by Taurus and Debolsillo (by Penguin Random House Grupo Editorial), Swedish by Leopard, Thai by ASTV Manager Co., Turkish by Hiperlink Egtim Iletisim Yay, and Vietnamese by DT Books. Audio version published by Tantor Media. Mismeasuring Our Lives: Why GDP Doesn't Add Up, with Amartya Sen, Jean-Paul Fitoussi, and J.E. Stiglitz, eds., The New Press, 2010. 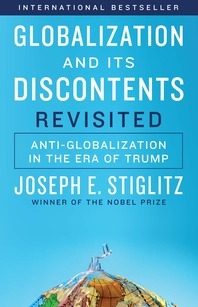 The Stiglitz Report: Reforming the International Monetary and Financial Systems in the Wake of the Global Crisis, J.E. Stiglitz, The New Press, 2010. Selected Works of Joseph E. Stiglitz: Volume I: Information and Economic Analysis, Oxford University Press, February 2009. The Three Trillion Dollar War: The True Cost of the Iraq Conflict, W.W. Norton, with Linda Bilmes, March 2008. Also published in the UK by Penguin, in Arabic by Dar al Kitab al Arabi, in Chinese simplified characters by China Renmin, in Dutch by Het Spectrum, in French by Fayard, in German by Siedler, in Indonesia by Mizan Pustaka, in Italian by Einaudi,, in Japanese by Tokuma Shoten, in Korean by Strategy and Culture Publishing, in Polish by PWN, in Romanian by Editura Tehnica, in Spanish by Taurus, and in Turkish by ODTU Gelistirme Vakfi. Making Globalization Work, WW Norton, September, 2006. Also published in the UK by Penguin/Allen Lane, in audio format by Audible, in Arabic by Arabic Book Program Cairo, in Catalan by Empuries, in complex Chinese by Commonwealth, in simplified Chinese by China People’s Publishing House, in Croatian by Algoritam, in Dutch by Het Spectrum, in French by Fayard, in German by Siedler, in Herbrew by Arieh Nir, in Indonesian by Mizan Pustaka, in Italian by Einaudi, in Japanese by Tokuma Shoten, in Korean by Book 21, in Malayalam by Kerala State Institute of Languages, in Norwegian by Pax Forlag, in Polish by PWN, in Portuguese by Companhia das Letras (Brazil) and ASA Editores (Portugal), in Romanian in Editura Polirom, in Serbian by Informatika, in Spanish by Debolsillo and Taurus, in Swedish by Daidalos, in Thai by Suan Nguen Mee Ma Press, in Turkish by Plan B, and in Vietnamese by Youth Publishers. Economics, Fourth Edition, with Carl E. Walsh, W.W. Norton & Company, December 2005. Also published in Chinese simplified by China Renmin, in English by Viva Books (India) and Wiley Australia (Australia & New Zealand), in French by de Boeck, and in German by Oldenbourg, in Greek by Papazissis, and in Japanese by Toyokeizai Shinposha. Third Edition, with Carl E. Walsh, W.W. Norton & Company, 2002. Also published in Chinese (simplified) by China People’s University Press and China Renmin, French by Edition de Boeck, in Japanese by Toyokezai Shinposha, in Portuguese by Editora Campus, and in Romanian by Economica. Second Edition, W.W. Norton & Company, 1997. Also published in Chinese simplified by China People’s University Press and China Renmin, in French by Edition de Boeck (France) and by USIA/Nouveaux Horizons (Haiti and Africa), in German by Oldenbourg Verlag, in Italian by Bollati Boringhieri Editore, in Japanese by Toyo Kiezai Shinposha Ltd, and in Korean by Hanul. First Edition, W.W. Norton & Company, 1993. Also published in Catalan by Editorial Ariel. In Chinese simplified by China People’s University Press, in French by Edition de Boeck (France) and USIA (Haiti and Africa), in Italian by Bollati Boringhieri Editore, in Japanese by Toyo Kiezai Shinposha Ltd, in Latvian by The University of Latvia, in Spanish by Editorial Ariel (Spain) and Planeta International (Latin America). Principles of Macroeconomics, Fourth Edition, with Carl E. Walsh, W.W. Norton & Company, December 2005. Third Edition, with Carl E. Walsh, W.W. Norton & Company, 2002. Translated in Portuguese by Editora Campus and in Spanish by Editorial Ariel. Second Edition, W.W. Norton & Company, 1997. First Edition, W.W. Norton & Company, 1993. Principles of Microeconomics, Fourth Edition, with Carl E. Walsh, W.W. Norton & Company, December 2005. Also published in French by de boeck and in Japanese by Toyokeizai Shinposha. Third Edition, with Carl E. Walsh, W.W. Norton & Company, 2002. Also published in Italian by Ulrico Hoepli Editore, in Portuguese by Editora Campus, and in Spanish by Editorial Ariel. First Edition, W.W. Norton & Company, 1993. Also published in Spanish by Editorial Ariel. Fair Trade For All,with Andrew Charlton, Oxford University Press, December, 2005. Also published or to be published in Arabic by Elias Modern Publishing House of Cairo, in Simplified Chinese by China Renmin University Press, in Croatian by Masmedia, in Czech by Victoria, in French by Fayard, in German by Murmann, in Hungarian by Lexecon, in Italian by Garzanti, in Japanese by Nihon Keizai, in Korean by Nexus, in Polish by PWN, in Portuguese by Elsevier (Brazil) and ASA (Portugal), in Russian by Ves Mir, and in Spanish by Taurus. The Roaring Nineties, W.W. Norton & Company, October 2003. Also published in the U.K. by Penguin/ Allen Lane. Translated in Arabic by Dar al-Farabi, in complex Chinese by Commonwealth, in simplified Chinese by China Financial, in French by Fayard, in German by Siedler, in Greek by Livani, in Hungarian by Napvilag Kiado, in Indonesian by Marjin Kiri, in Italian by Einaudi, in Japanese by Tokuma Shoten, in Korean by Sejong, in Polish by PWN, in Portuguese by Companhia das Letras (Brazil) and Terramar (Portugal), in Romanian by Editura Economica, in Russian by National Public Scientific Foundation, in Spanish by Taurus, and in Turkish by CSA Global. Towards a New Paradigm in Monetary Economics, with Bruce Greenwald, Cambridge University Press, May 2003. Also published in Japanese by University of Tokyo Press and in French by Economica. Globalization and Its Discontents, W.W. Norton & Company, June 2002. Also published by Penguin Books (UK); Profil (Croatian); Alfa Basim Yayim Dagitm Tic (Turkish); Einaudi (Italian); Radarami (Georgian); ASTVmanager (Thai); Siedler (German); Turiba (Latvian); Youth Publisher (Vietnamese); Monsudar (Mongolian); Ecumenical Institute (Sinhala); Zenith (Albanian); Prophetes Globalizacija (Slovenian); China Machine Press (Chinese Simplified); PWN (Polish); PT Ina Publikatama (Indonesian); Livani (Greek); Taurus (Spanish); Tokuma Shoten (Japanese); Azerbaijan Center for Economic Reforms (Azeri); D C Books (Malayalam); Dar al-Farabi (Arabic); Editura Economica SRL (Romanian); Empuries (Catalan); Fayard (French); Hakibbutz Hameuchad (Hebrew); Het Spectrum (Dutch); Info Dar (Bulgarian); Kyiv Mohyla (Ukrainian); Leopard (Swedish); Locus (Chinese Complex); Napvilag Kiado (Hungarian); National Public Scientific Foundation (Russian); PT-Kustannus (Finnish); Prostor (Czech); Sejong Books (Korean); Spektrum (Norwegian); Miba Books (Serbian). State Versus Market Debate: Have Asian Currency Crises Affected the Reform Debate? Published for Bangladesh Economic Association by University Press, January 1999. Whither Socialism? (Wicksell Lectures), MIT Press, January 1996. Peasants Versus City-Dwellers, Joseph E. Stiglitz and Raaj K. Sah, Oxford City Press, 1992. The Economic Role of the State, Joseph E. Stiglitz et al., Edited by Aanold Heertje, Blackwell, 1989. The Theory of Commodity Price Stabilization: A Study in the Economics of Risk, Ewith David M.G. Newbery, Oxford University Press, 1981. 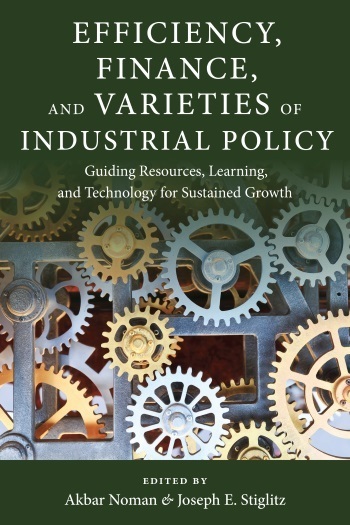 Efficiency, Finance, and Varieties of Industrial Policy, Akbar Noman and Joseph E. Stiglitz, eds., Initiative for Policy Dialogue at Columbia, New York: Columbia University Press, 2016. Too Little, Too Late: The Quest to Resolve Sovereign Debt Crisis, Martin Guzman, Jose Antonio Ocampo and Joseph E. Stiglitz, eds., Initiative for Policy Dialogue at Columbia, New York: Columbia University Press, 2016. Inequality and Growth: Patterns and Policy, Volume I: Concepts and Analysis, Joseph E. Stiglitz and Kaushik Basu, eds., IEA Conference Volume No. 156-I, Houndmills, UK and New York: Palgrave Macmillan, 2016. Inequality and Growth: Patterns and Policy, Volume II: Regions and Regulations, Joseph E. Stiglitz and Kaushik Basu, eds., IEA Conference Volume No. 156-II, Houndmills, UK and New York: Palgrave Macmillan, 2016. Contemporary Issues in Macroeconomics: Lessons from The Crisis and Beyond, Joseph E. Stiglitz and Martin Guzman, eds., IEA Conference Volume No. 155-II, Houndmills, UK and New York: Palgrave Macmillan, 2016. Contemporary Issues in Microeconomics, Joseph E. Stiglitz and Martin Guzman, eds., IEA Conference Volume No. 155-III, Houndmills, UK and New York: Palgrave Macmillan, 2016. Taming Capital Flows: Capital Account Management in an Era of Globalization, Joseph E. Stiglitz and Refet S. Gurkaynak, eds., IEA Conference Volume No. 154, Houndmills, UK and New York: Palgrave Macmillan, 2015. Industrial Policy and Economic Transformation in Africa, Akbar Noman and Joseph E. Stiglitz, eds., Columbia University Press, New York, 2015. Life After Debt: The Origins and Resolutions of Debt Crisis, Joseph E. Stiglitz and Daniel Heymann, eds., Houndmills, UK and New York: Palgrave Macmillan, 2014. Also published in Spanish by Eudeba. Intellectual Property Rights: Legal and Economic Challenges for Development, Cimoli, Dosi, Maskus, Okediji, Reichman, Stiglitz, eds., Oxford: Oxford University Press, 2014. What Have We Learned?, George A. Akerlof, Olivier Blanchard, David Romer, and Joseph E. Stiglitz, eds., Cambridge, MA: MIT Press, 2014. Law and Economics with Chinese Characteristics: Institutions for Promoting Development in the Twenty-First Century, David Kennedy and Joseph E. Stiglitz, eds., Oxford: Oxford University Press, 2013. The Quest for Security: Protection without Protectionism and the Challenge of Global Governance, Joseph E. Stiglitz and Mary Kaldor, eds., New York: Columbia University Press, 2013. The Global Macro Economy and Finance, Joseph E. Stiglitz, J. Fitoussi, and R. Gordon, eds., London: Palgrave Macmillan UK, 2012. Good Growth and Governance in Africa, Akbar Noman, Kwesi Botchwey, Howard Stein, and Joseph E. Stiglitz, eds., Oxford: Oxford University Press, 2012. In the Wake of the Crisis, Olivier J. Blanchard, David Romer, Michael Spence and Joseph E. Stiglitz, eds., Cambridge, MA: MIT Press, 2012. Sovereign Wealth Funds and Long-Term Investing, Patrick Bolton, Frederic Samana, and Joseph E. Stiglitz, eds., New York: Columbia University Press, 2011. The G20 and Recovery and Beyond: An Agenda for Global Governance for the Twenty-First Century (PDF), e-book published in 2011 by The Paris Group (Chairmen Jean-Paul Fitoussi and Joseph E. Stiglitz). Debates on the Measurement of Global Poverty, with Sudhir Anand, Paul Segal, and Joseph E. Stiglitz, eds., Initiative for Policy Dialogue Series, Oxford: Oxford University Press, 2010. Time for a Visible Hand: Lessons from the 2008 World Financial Crisis, with S. Griffith-Jones, J.A.Ocampo, and J.E. Stiglitz, eds., Initiative for Policy Dialogue Series, Oxford: Oxford University Press, 2010. Industrial Policy and Development, Mario Cimoli, Giovanni Dosi and Joseph E. Stiglitz, eds., Oxford: Oxford University Press, 2009. Capital Market Liberalization and Development, Joseph E. Stiglitz and José Antonio Ocampo, eds., Oxford: Oxford University Press, 2008. 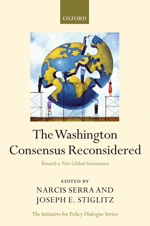 The Washington Consensus Reconsidered, Narcís Serra and Joseph E. Stiglitz, eds., Oxford: Oxford University Press, 2008. Escaping The Resource Curse, Macartain Humphreys, Jeffrey D. Sachs, and Joseph E. Stiglitz, eds., New York: Columbia University Press, 2007. New Ideas About Old Age Security: Toward Sustainable Pension Systems in the 21st Century, edited with Robert Holzmann, World Bank, January 2001. 1%: Privilege in a Time of Global Inequality, edited by Myles Little, Passage by Joseph E. Stiglitz, Hatje Cantz, 2016. Joseph Stiglitz for Project Syndicate: The Complete Archive, 2001-2011, Project Syndicate, 2001. Economics for an Imperfect World: Essays in Honor of Joseph E. Stiglitz, edited by Richard Arnott, Bruce Greenwald, Ravi Kanbur, and Barry Nalebuff, The MIT Press, 2003. The Rebel Within: Joseph Stiglitz and the World Bank, edited by Ha-Joon Chang, Anthem Press, 2002. "Preface," in The New Russia: Transition Gone Awry, L. Klein and M. Pomer (eds. ), Stanford, CA: Stanford University Press, 2001, pp. xvii-xxiii. "Introduction," with Robert Holzmann, New Ideas about Old Age Security, Robert Holzmann and Joseph E. Stiglitz (eds.). Washington: World Bank, 2001, pp. 1-16. (Presented at the conference on "New Ideas About Old Age Security," World Bank, Washington, DC, September 14-15, 1999. )"Foreword," in The Great Transformation: The Political and Economic Origins of Our Time, Karl Polanyi , Boston: Beacon Press, 2001, pp. vii-xvii. "Introduction" and "Conclusions," with H. de Largentaye, P. Muet, and J. Rischard, in Governance, Equity and Global Markets: Proceedings from the Annual Bank Conference on Development Economics in Europe, June 1999, Conseil d'Analyse economique, Paris, 2000, pp. 9-18 and 237-238. Printed in French in Revue d'Economie du Developpement, 0(1-2), June 2000. "Introduction," with Boris Pleskovic, in Annual World Bank Conference on Development Economics 1999, Boris Pleskovic and Joseph E. Stiglitz (eds. ), World Bank, Washington, D.C., 2000, pp. 1-13. "Introduction," The World Bank: Structure and Policies, Christopher L. Gilbert and David Vines, (eds. ), Cambridge University Press, Cambridge, 2000, pp. 1-9. Alternatively, view a list of all my books available online.